Lalizas Inflatable life jackets Lamda 150Ν, Lamda 275N & Delta 150N follow the latest SOLAS specifications for ultimate safety, while on board. They feature twin chambers for double security and each chamber can be inflated via its individual Lalizas automatic operating head (20260, certified per ISO 12402-7), which also supports manual activation. The inflatable chamber, which is made of High Visibility Yellow fabric, is folded into a valise with Velcro closure and its inflation tube incorporates the new Lalizas red pressure relief valves (20611, certified per ISO 12402-7). All models are equipped with Lalizas retro reflective tapes (70180), a whistle (70010, certified per ISO 12402-7 & 8) and a lifting loop with yellow buddy line for easier rescue. Additionally, all approved Lalizas SOLAS life jacket flashlights (70280, 71209, 71210) can be added. 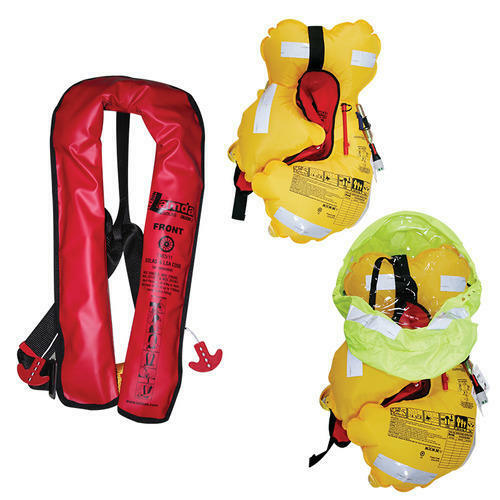 These extra user-friendly life jackets, provide the maximum safety thanks to their fast inflation ability, even at very low temperatures and are available in one adult size, which can be easily adjusted to passengers with chest size up to 175cm or more, with the use of the Lalizas waist belt extender (71161). The new top-of-the-range Lalizas SOLAS Lamda 275N inflatable life jacket offers the ultimate sense of security against every situation, in any sea across the world, thanks to the great size of its chamber and the 275 Newton buoyancy provided by the double 60gr CO2 cylinders.